Neurons were abuzz and synapses atwitch Dec. 11 when the circuits of science and music connected at the Max Planck Florida Institute for Neuroscience in Jupiter on FAU’s John D. MacArthur campus as the prestigious global scientific organization presented the latest in its series of public programs marked by the interaction of the two disciplines. 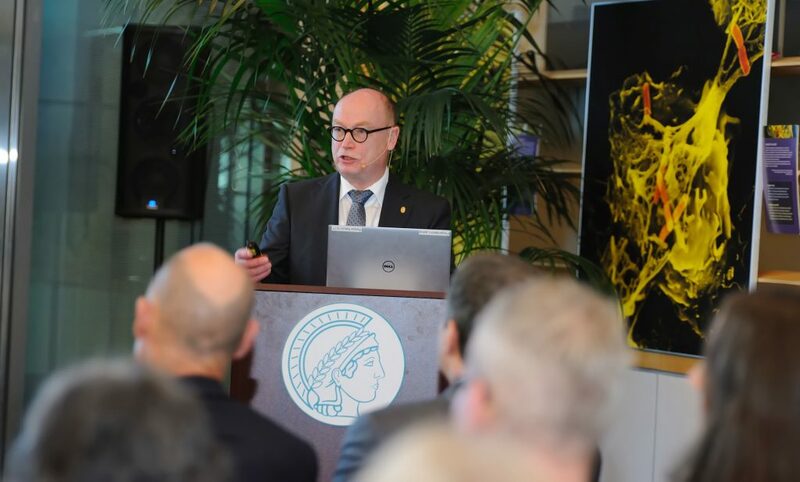 Dr. Martin Stratmann, president of the Max Planck Society, pointed out, both are driven by the urge to understand how the mind operates and both are driven by creativity, passion and discipline. The scientists of the Max Planck Institute look through the lens for answers on the micro level, whereas artists tend to gaze at the macro-existential picture. The Institute is named for Planck, who was a 1918 Nobel prize winner and Einstein pal who is best known as the founder of the quantum theory of physics, which I’m still not so sure I understand. I believe it has to do with pretty small stuff that makes big impressions. 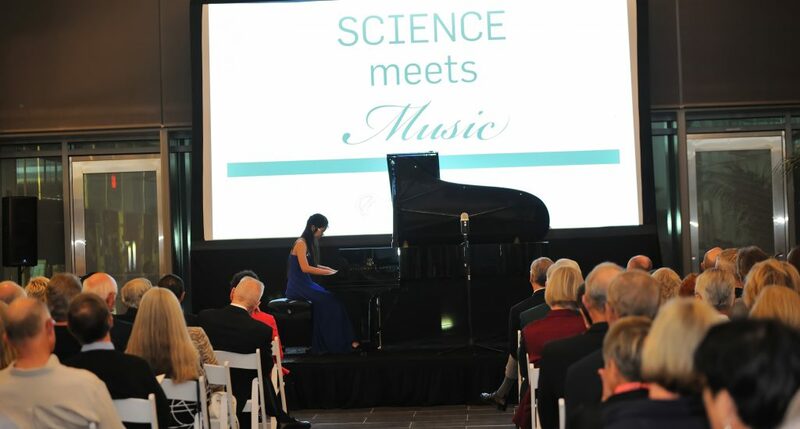 Surrounded by colorful enlarged representations of microscopic views in the soaring atrium of the Institute’s laboratories, pianist Lylybell Zhou clearly demonstrated the relationship between the two in her precisely rendered performance of Beethoven’s dramatic Sonata No. 18 (in E-flat, Op. 31, No. 3) and Prokoviev’s Sonata No. 1 (in F minor, Op. 1), which encircled Stratmann’s presentation like a sympathetic parenthesis. Zhou is a junior at the Alexander W. Dreyfoos School of the Arts and one of six students interning at the Institute’s summer research program in 2017. I was particularly proud and delighted to see her, as she had once been a student of mine. I confess to feeling a bit like a specimen on a lab slide as I discussed the current state of literature and the potential effects of artificial intelligence and algorithms on the form with one scientist, listened to a spirited debate on climate change by others and learned how ultraviolet light disinfects hospital rooms and ambulances. Some 150 scientists, donors and friends attended, snacking on hors d’oeuvres from Prosecco Café passed at the opening reception. 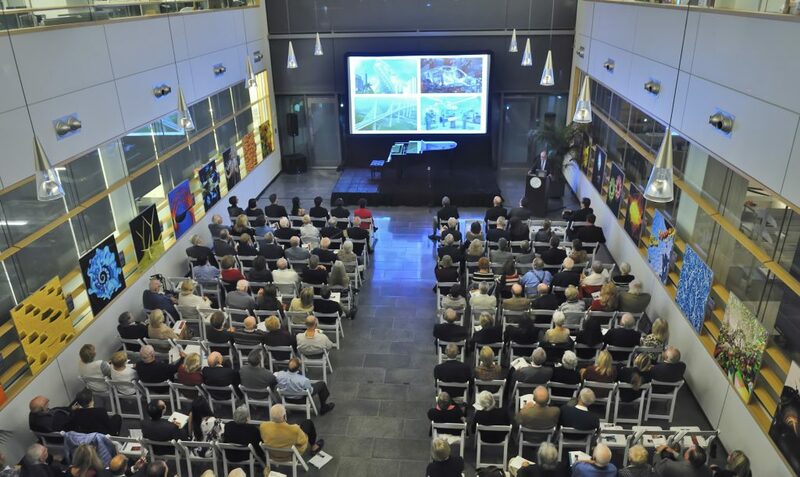 The Max Planck Institute will present three more lecture-musicales: on Wednesday, Jan. 31, with Dr. Stefan Hell, director of the organization’s biophysical chemistry research and 2014 Nobel Laureate; Wednesday, March 28, with Dr. Jason Christie, research group leader; and Wednesday, April 18, with Dr. Manfred Gahr, the Institute’s director of ornithology (the study of bird brains which turn out to be pretty smart, since they learn how to sing, something even Siri can’t do) at the Benjamin Upper School in Palm Beach Gardens. Becky and Jimmy Moyer sponsor the music. The presentations are open to the public, but seating is limited so registration is required, 561-972-9027.